Times are getting very exciting right now. Why? Well, we're heading unavoidably into the end of spring migration - and that's a good thing! Why? I again hear you ask! Well, the back end of migration periods are often very interesting, for it is then that the unexpected could almost be expected to show up. Those lost birds that have been wandering around for several weeks may finally surface somewhere obvious like a migration watchpoint, where they are more likely to be found by a birdwatcher and it is this that makes June (and November of course) such a fascinating time. This morning's walk at the state park was a good case in point. Things generally are winding down as local birds get well into this year's breeding routine - and yet we scored more birds this week than we've had in the past few Wednesdays. And the additions were all nice surprises! A lone adult Brown Pelican flew slowly past us offshore, a single Glossy Ibis was poking in the mud around the pond margins and the Plover Ponds were bristling with late migrating shorebirds, including five Short-billed Dowitchers and really fine White-rumped Sandpiper. Perhaps best of all (since eBird asked me to confirm the sighting!) 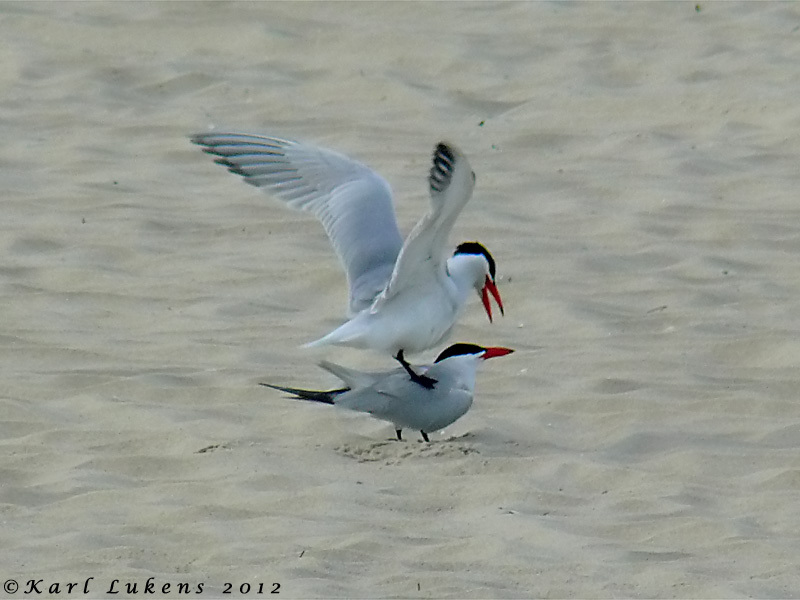 was a very dapper pair of Caspian Terns, their bills resplendent in brilliant red breeding color, that graced the beach for a while and even went through some pretty heavy petting! Karl Lukens sent me these images from this morning's walk. Caspian Terns are scarce birds here in the spring, so a fired up pair on South Cape May Beach this morning was a nice surprise. A handful of White-rumped Sandpipers find their way to Cape May in spring; this bird was on the Plover Ponds today. With weather patterns looking changeable over the next few days, good birds may very well continue to come our way and Cape May is certainly going to be an interesting place to be. Richard Crossley reported three Mississippi Kites over the Beanery on 28th, so they may well still be hanging around in the area. 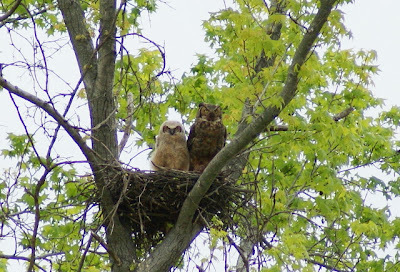 Pine and Yellow-throated Warblers are singing quite strongly around Belleplain State Forest at the moment so second broods may well be getting under way. A Willow Flycatcher was calling from my own yard this morning, which is the first of this traditionally late migrant that I have heard of here this spring, so there's still much excitement to be had! Spring, all those birds and that warming weather really makes for an ideal combination to bring out those camera-toting birdwatchers! Here's a selection of pictures I have received recently which all deserve a wider audience - and all highlight the wonder that is birding around Cape May. ... while gaudy Indigo Buntings peeped from mulberry perches. ... with nearby Piping Plovers. ... and Yellow Warblers required no careful searching - they just sat and stared back at us! 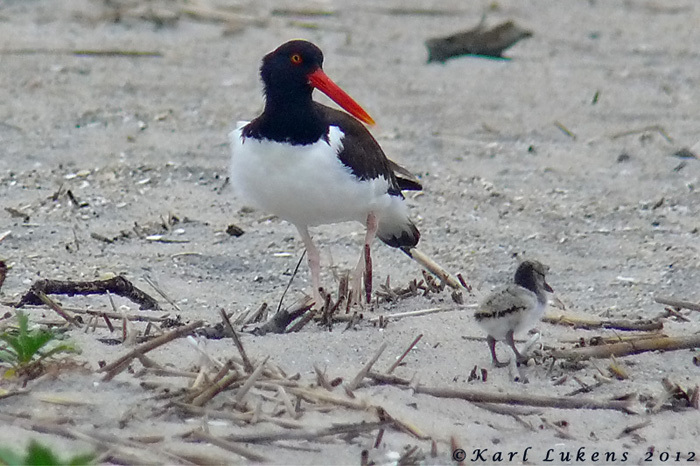 Our Spring Weekend was ideally timed to see the first American Oystercatchers of the season - here captured for posterity by Karl Lukens. My post about the breeding-plumaged Purple Sandpipers at the Higbee canal jetty certainly got people heading over there to enjoy this uncommon spectacle. Tony Leukering kept a close eye on the birds and got this amazing picture of one of the birds in flight - I need a new camera!! Good friend and regular visitor to the bird observatory, Lambert Orkis never ceases to amaze me with the fabulous shots he manages to get around Cape May. 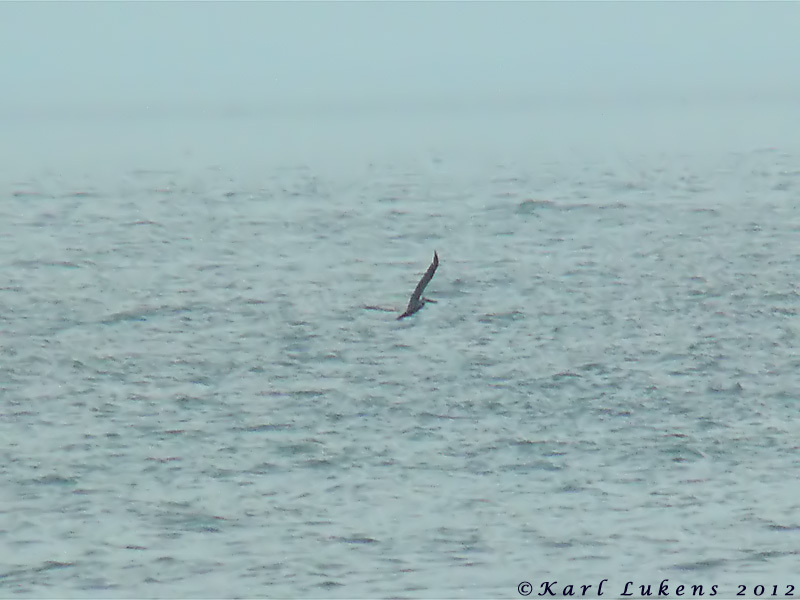 I just had to post these two shots of a Black Skimmer fishing that Lambert took over Spring Weekend. Our local network has been rather quiet this past few days, but there is always much to enjoy around Cape May, any time of year. Breeding birds are well into their season now with many first broods of youngsters already put and about and adult males starting to sing again as they prepare for the next brood. The bayshore remains exciting too as horseshoe crabs will continue to be much in evidence for at least another two weeks yet. Head for the delaware Bay and enoy shorebirds at Cook's and Reed's Beach or higher up at Thompson's Beach, East Point or Heislerville - but be prepared for the no see 'ums! Sooty Shearwaters are in the news around Cape May right, for it is in late May and early June that their life cycle sees them passing off our shores. Sooties breed in the Southern Hemisphere, on Sub-Antarctic islands off southern South America, New Zealand and Australia. After breeding during October to April, the Atlantic Ocean birds - mostly breeding around the Falklands and neighboring islands off Argentina and Chile - start to head north up the east coast of the Americas, with many spending the northern summer off Newfoundland, around the Grand Banks. As the season passes, many return southward directly to their breeding grounds, while others - perhaps none-breeders - continue eastward and spend August to October moving south via the coasts of Europe and Africa. To us, this seems like an extraordinary lifestyle, essentially cruising from one end of the planet and back again under their own steam! But shearwaters are highly adapted to such a lifestyle and I had a rare opportunity to look into this today. Sam Galick called to tell me that he had found a dead Sooty Shearwater on the South Cape May beach, so I hurried along to try to retrieve the body before the heat and gulls had a chance to do their worst (on the walk out I passed a nice Lesser Black-backed Gull by the way!). Here's a few photos I took of the bird before it was put in the icebox to await delivery to the Academy of Natural Sciences in Philadelphia. The upper side of a Sooty Shearwater is pretty much uniform, dark chocolate brown. Below, sooties are a little paler, though still rather plain, brown without any of the white found on many shearwater species. One feature that can be seen on a flying Sootie is the pale gray, sometimes silvery-looking, underwing, which can be seen here. I consulted quite a number of books to try and establish something useful with regard to molt and ageing of our bird, but didn't come up with anything that the books seem to agree on. However, it did seem to me that all the bird's feathers were of the same age, there was no clear evidence of it having a contrast in the plumage that would indicate a mix of old and new feathers. Also, in the picture above, the tips of the secondary wing feathers seem to be broad and show no obvious sign of wear, suggesting they are pretty fresh. This would all seem to suggest that this is most likely a juvenile bird, born this past breeding season. Shearwater legs and feet are interesting. The legs are laterally compressed, providing a shape that give a much stronger structure for shuffling along on. As with many seabirds, shearwaters shuffle along on the back of the lower leg (technically the equivalent of the sole of our foot, so fair enough! ), rather than standing up on their toes like most birds. This is important to know if you go banding them, as you have to use specially designed, C-shaped bands. Note here that the Sootie's legs are a different color on the inside and outside! 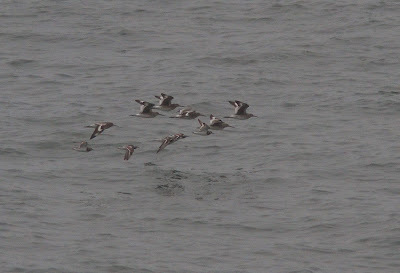 Shearwaters are in a group of birds collectively known as tubenoses. This group of seabirds, which also includes the albatrosses, has a special adaptation for getting rid of all that salt that dominates their marine world. salt-laden water is filtered out of the bird's body and exits via those two large nostrils (the eponymous 'tubenose') on the top of the bill. The water runs along the groove that you can see here and finally drips off the end of the bill - like a runny nose! Pretty clever stuff. 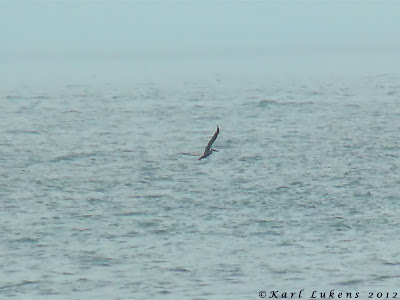 Keep an eye out these next few weeks for these ocean wanderers as they pass by far out over the waves, or look for Wilson's Storm-petrels which have a similar life cycle but may often be seen much closer to land in the mouth of the Delaware Bay, fluttering over the water like swallows or martins. Anyone who knows me will know that I don't venture outside of Cape May County very often. Indeed, you may be very surprised to hear that I have only been to Heislerville (in Cumberland County) once since moving to Cape May three years ago - and I've never been in spring, when the place truly is at its best! So, with my fondly cherished record soon to be in tatters, it was with a heavy heart that I found myself heading down Matt's Landing Road today - though our arrival was held up briefly while I shifted a Mud Turtle off the road! Heislerville really buzzes with activity in Spring; even as we were arriving, Great and Snowy Egrets were busy at their nests, two Glossy Ibises cruised over and single Black-crowned Night Herons could be seen ferrying back and forth overhead. Water levels on the main shorebird lagoon have been unfortunately unpredictable this year due - I'm told - to a problematic sluice, but even so, the assorted masses of shorebirds were still a delight to behold. Chief among them were great swathes of Dunlin and Semipalmated Sandpipers, all either resting or refueling before their onward connection to the Arctic tundra. Good numbers of other shorebirds were present too, including Short-billed Dowitchers, Greater and Lesser Yellowlegs, Ruddy Turnstone (actually just one or two of these as they prefer to be lower down the Delaware Bay), Willet and Black-bellied and Semipalmated Plovers. But our main interest was in the one that was a little different, a little out of place here - a Curlew Sandpiper, which by rights should be making its way up through Eastern Europe to the Russian Arctic about now! Heislerville has become one of the most reliable places in all of North America for this species in recent years and today we were in luck. As well as the Curlew Sandpiper, we also got lucky with a Clapper Rail which crossed the dirt road in front of our car, as well as a female Least Bittern which we saw well in flight. Give Heislerville a go around high tide any time over the next two weeks and you should find a whole lot of great birds to enjoy! Here's a short picture essay of today's visit. Heislerville is packed with birds right now and none are more snazzy than these Dunlins in full breeding colors [photo by Mike Crewe]. 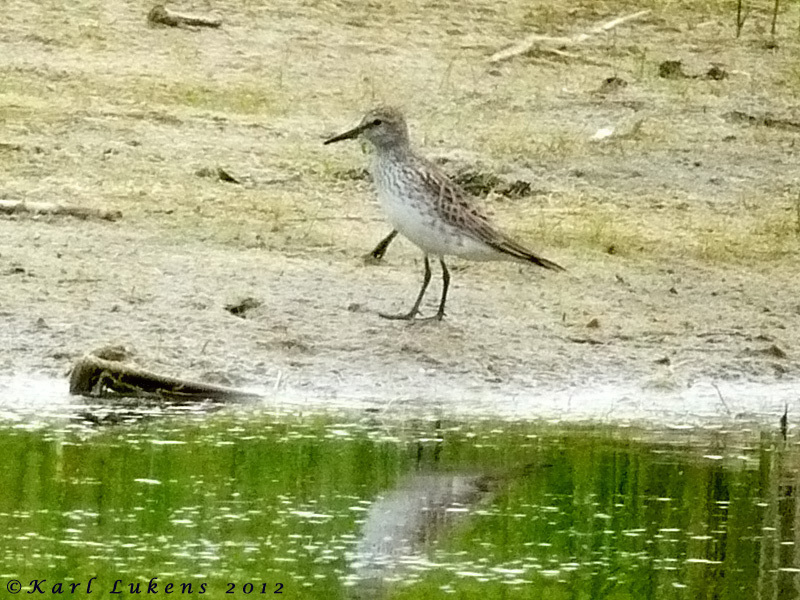 Our target - the Curlew Sandpiper we had been seeking. Note the curlew-like, decurved bill with very fine tip, the rich rufous and black tones on the back, brick-colored flanks and white undertail [photo by Mike Crewe]. Curlew Sandpiper at Heislerville today; note all the points as listed above. This individual is most likely a female as the underpart coloration is pinkish rather than dark cinnamon and barely extends to the head, which is largely grayish in color [photo by Mike Crewe]. Just for size comparison, here's the same bird with a Semipalmated Plover [photo by Mike Crewe]. Here's the Curlew Sandpiper (far right) with a group of other shorebirds - a breeding-plumaged Dunlin (front left) Semipalmated Sandpiper (in front of Curlew Sandpiper) and five Short-billed Dowitchers. This offers many opportunities to compare and contrast the birds. Note that the Curlew Sandpiper is about the size of the Dunlin but with a finer-tipped bill, and clearly smaller than the dowitchers. 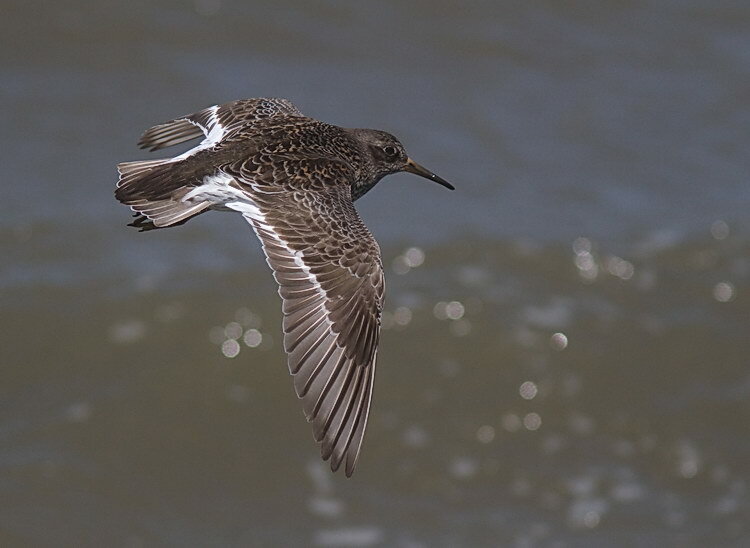 The plumage of the sandpiper is pretty similar to the dowitchers, but note that the sandpiper has barely any supercilium above the eye, has a decurved (not straight) bill and is much whiter towards the back end below [photo by Mike Crewe]. If you are shorebird watching over the next couple of weeks, be sure not to miss the Black-bellied Plovers, which look fabulous this time of year [photo by Mike Crewe]. Always have the camera ready! This male Orchard Oriole showed off in the reeds right beside our car - click, click, click!!! [Photo by Mike Crewe]. With winds primarily in the East or North-easterly sectors this past few days, Cape May has been pretty quiet for migrants, though Tom Reed had a few warblers along the bayshore at Reed's Beach this morning. 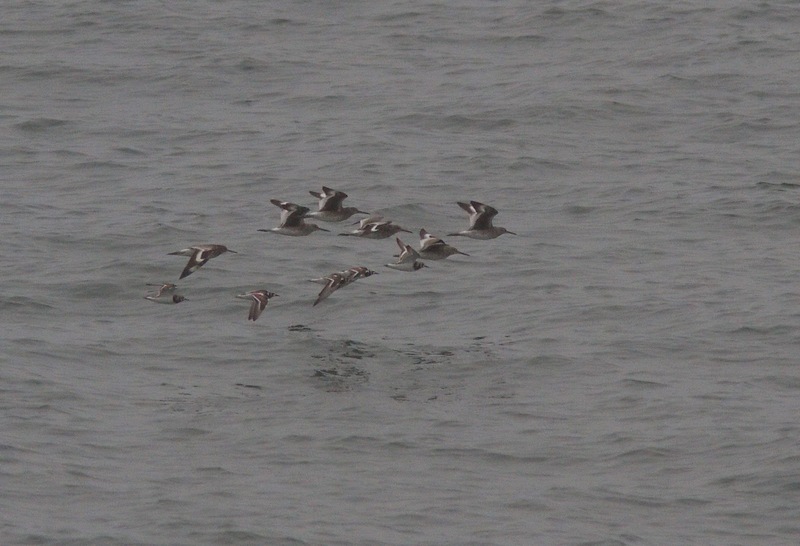 On May 20th, Sooty Shearwaters were in the news, with reports from a number of locations, including the beachfront at Avalon, where Tom Reed was able to notch up a tally of over 60 birds between spells of work (!). Wilson's Storm-petrels and a distant, unidentified jaeger were off Cape May Point on 21st, Vince Elia reported a Western Sandpiper among the Semipalmateds at Heislerville today (22nd) and Tom Reed had two Western Willets at Stone Harbor Point, also today. The Purple Sandpipers at the canal jetty nearest to Higbee Beach continue to attract attention and Tony Leukering reported 43 from there today. For anyone seeking Red Knots, it seems that numbers are at last growing with some high counts coming in now from both Nummy's Island and Cook's Beach. A good passage of northbound shorebirds took place up the lower Delaware Bay today and Tony Leukering took these nice shots of Semipalmated Sandpipers (upper) and Willets and Ruddy Turnstones (lower) passing the ferry. Wilson's Storm-petrels were also east to see from the ferry today. Don Freiday gave an excellent talk on Friday night at the Cape Maygration Spring Weekend, entitled 'How to identify birds like an expert'. In this talk Don covered - among many other things - the subject of how experts have the acquired knowledge to simply be able to recognize a bird; in other words, they can know what a bird is without having to actually go through a lengthy process of identification steps. This was a very timely comment for me. On Thursday morning, while leading a Higbee Beach walk, I called people's attention to a flock of roosting shorebirds on the stone jetty at the mouth of the Cape May Canal. Hmm, I knew there had been a couple of Purple Sandpipers around recently, but this flock of 30 or so birds was probably more likely to be Sanderling, or perhaps Semipalmated Sandpipers, since such a high number of birds would surely not be Purple Sandpipers in May; after all, this is a wintering species here. The problem I had was that when I got a better look through the scope, I could have sworn that I could see pale legs. That's going to rule out so many of the peeps and left me in a quandry. I wasn't sure what these birds were - and yet I know Purple Sandpiper, I see them every year, up close and personal. The birds were there again for the Friday walk. I was shaken! I had to point these out to people and call them Purple Sandpipers, and yet I didn't 'know' these birds, they weren't right somehow. I didn't recognize them. Time for closure, time to settle this once and for all! Tony Leukering and I walked down the jetty, right to the end, on Friday lunchtime, and we were amazed. Here they were, 30 Purple Sandpipers on May 18th - and all (of course!) in very unfamiliar breeding plumage. Gone were my usual cues - the flat gray upperparts contrasting rather weakly with the slightly paler underparts to give an overall rather plain bird. Instead, here were birds with dark, blackish, feather centers on the back and heavy blotching and streaking on the head and breast. A very unfamiliar bird, and a wonderful learning curve for me. 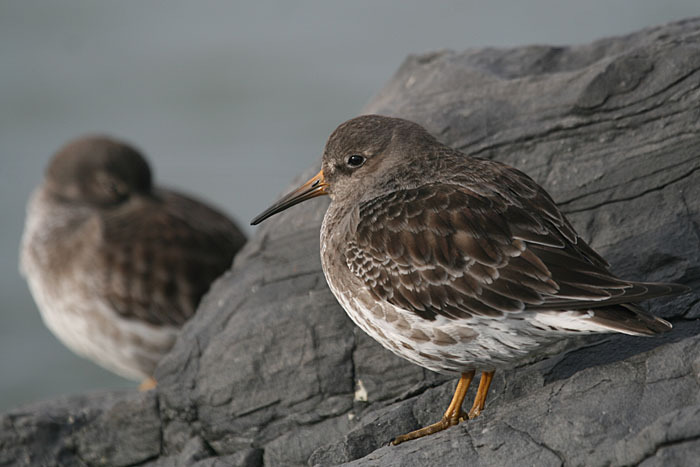 Sibley's The Birds of Cape May lists a flock of 40 Purple Sandpipers on May 28th 1983, so this is no recordbreaker, but if you can get down to Higbee Beach and have a look at these birds, it really is quite a treat. A surprising sight in May: 23 of the 30 or so Purple Sandpipers on the canal jetty this week [photo by Mike Crewe]. A most unfamiliar bird to most of us - a Purple Sandpiper in its May plumage. All the birds present had large black centers to the mantle and scapulars, but almost no warm, rufous tones. This seems to suggest that they were all first-summer birds (ie hatched in 2011) so perhaps they are loitering this year well south of the breeding range and will return to the Arctic to breed in 2013. This was a particularly dark bird with just a tiny amount of pale olive at the base of the bill and pretty dark legs [photo by Mike Crewe]. This individual has more olive on the legs and bill and at least some warmer margins to the upperparts [photo by Mike Crewe]. Another bird which looks somewhat intermediate between the two above [photo by Mike Crewe]. For reference, here's everyone's idea of a standard Purple Sandpiper - taken at Barnegat Light in December 2009 [photo by Mike Crewe]. Apologies to regular readers of our blog, I can't believe it's been a whole week since I sat down and let you know what's going on in Cape May. Well, what is going on, of course, is that we are at the peak of spring activity here - and that's the peak for both birds and for people. Saturday May 12th was our 29th annual World Series of Birding event - and what a day that was! Spring migration has been a little hit and miss here this year so far, with little in the way of westerly winds to drift birds our way, but we're used to that and there really isn't a bad day to go birding at Cape May this time of year. Indeed, it's such a great place that they even named a month after it! Despite early worries though, Word Series day was near perfect and we even had a good run of spring migrants right on the day that we needed it! As ever, it was a fabulous day, with 63 teams taking part and turning in some great counts, all of which help to raise money not only for Cape May Bird Observatory and New Jersey Audubon, but also for many other worthy causes by way of sponsorships and pledges. The results? I thought you might ask! Well, my boss's team won so I'm hoping for an easy week as he's bound to be in a good mood for a while! Yes, Team Zeiss, sponsored by Carl Zeiss Optics and consisting of Pete Dunne, Tom Reed, Will Russell and Luke Seitz, hit the top rung with a total of 207 species logged on the route around New Jersey. Pretty good I reckon! There were other worthy winners too in the various categories, among them team Zen Zugunruhe (don't ask, it's a migration thing!!) who notched up an impressive 173 species just in Cape County, while the Monarchists scoured the small area south of Cape May Canal on bikes and found an amazing 155 species - Cape May has the birds folks! In all, a grand total of 260 species of birds was logged by the various teams in New Jersey - great testament to the bird diversity here in what is often considered to be a heavily-populated state for us Human types. As for me? Well I was out there heading up the Cape May Century Run and, with a change of route this year, we achieved a count of 146 species - a personal best for me, but I reckon with our new route we can push for 150 next year!! Huge thanks are due to everyone who took part, either as a participant or as a helper with the organisational side of things. If you have never taken part - think about being part of our Century Run next year - it's crazy, of course, but it's just for one day of the year, everyone has survived it so far and it all goes towards the greater good! With another World Series safely behind us, we now find ourselves plunged headlong into Spring Weekend and our Cape Maygration festival. Yet again the streets, fields, woods and marshes (not to mention the backbays!) echo with the sound of happy birders, just being out there and enjoying the natural world. It is particularly good to see so many new faces coming to Cape May for the first time, having taking the plunge and dived headlong into birding in the past 12 months or so. We welcome you all - so far it's been fun, it can only continue to be so!! Bird news has come thick and fast this past few days so here's a quick round-up of what has reached my ears. Typically for the time of year, Mississippi Kites have continued to make the news, with the open skies overlooking the Rea Farm on Stevens Street being prime location for them. Up to three appeared there on May 10th and further sightings have been made since then, according to weather conditions. Generally an element of NW winds creates the best conditions to see these birds as they hunt dragonflies over the treetops. Both Broad-winged and Red-shouldered Hawk have been seen thermalling with the kites too. The usual spring competition between Heislerville in Cumberland County and Brigantine (Forsythe NWR) in Atlantic County has been going on, with Brigantine weighing in with a Curlew Sandpiper on 11th, the day after Heislerville had a Glaucous Gull on 10th. The latter was somewhat controversial at first as Don Freiday had seen and photographed a very interesting, very pale, American Herring Gull there which at first had been thought to be a Glaucous Gull. But photos confirmed the gull on 10th was a different bird and a good, white-washed, third-summer Glaucous. Heislerville had its own Curlew Sandpiper on 13th, which was joined the next day by a White-faced Ibis and a Wilson's Phalarope then four Black-necked Stilts showed up there on 16th. White-faced Ibises have continued in the news with one noted at Stipson Island Road on 11th while Eurasian Collared Doves seem to finally be making their mark in the region with three continuing at Cape May Point, one at Heislerville (found by Cornell Lab of Ornithology's World Series Team on a scouting mission) on 11th, one at Indian and West Street in Cape May on 15th and two flying east over the South Cape May Meadows on 16th. A Sooty Shearwater was reported flying past Stone Harbor Point on 13th, single Black Terns were at Cape May Point on 12th and Thoroughfare Island on 16th, a Scissor-tailed Flycatcher was seen briefly at Hidden Valley off New England Road on 17th while today (18th) two Mississippi Kites have again been gracing our skies around the point. In general, winds have not favored mass movements of birds through Cape May, but there is still much to enjoy. Horseshoe Crab numbers are building nicely along the bayshore from Miami Beach north to Reed's Beach (and no doubt onward into Cumberland County) and will most likely peak with the New Moon around the 19th; though shorebirds are slow to build up there at present, there are good numbers of Red Knot to be seen right now at Nummy's Island, along with plenty of Short-billed Dowitchers, Ruddy Turnstones, Least and Semipalmated Sandpipers, Black-bellied Plovers, Whimbrel and so much more. Heislerville - of course! - is proving fabulous once again - though things were slow due to a tricky sluice gate that couldn't be opened properly. I'm told that this has been fixed now so there are shorebirds a-plenty to be seen there. Belleplain has all its usual goodies in place, including a Whip-poor-will that we had calling loudly right at Sunset Bridge on World Series day. Bobolinks have been few and far between this year, but at least 15 were along Sumner Avenue just south of Woodbine on 12th, along with a singing Eastern Meadowlark. Dreary rain dampened proceedings around Cape May this past 24 hours, which is always a shame when so many people are out there trying to scout for their World Series of Birding teams - just two more days to go now!! The weather seems to have supressed bird movements through the area temporarily too, but the forecast for the weekend currently looks quietly promising, with dry weather and a light SW wind hinted at. Hmmm, sounds good for Higbee Beach! 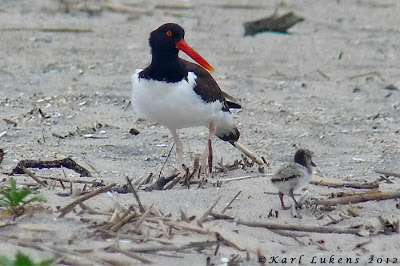 Despite the rain, small parties of shorebirds and other waterbirds trickled through Cape May Point today, with our state park walk turning up a very smart breeding-plumaged Tricolored Heron and three Black Skimmers as well as some passing Willets, Short-billed Dowitchers, Dunlin and Least and Semipalmated Sandpipers. Some of the highlights that I have heard of over the past few days have included King Rails reported from Heislerville and Turkey Point (both Cumberland County), a White-winged Dove at Whilldin Avenue, Cape May Point on 5th, singing Lincoln's Sparrow at Higbee Beach on 7th, Clay-colored Sparrow at Swainton, the occasional Parasitic Jaeger in the rips on and off and a Brown Pelican off the point today. Heislerville continues to attract good shorebirds, though water levels are higher than intended there this year due to a faulty sluice gate system, which is being worked on I hear. Still, White-faced Ibis, Stilt and White-rumped Sandpipers, Ruddy Duck and a number of other species have been there of late so let's hope they hang on until the weekend! 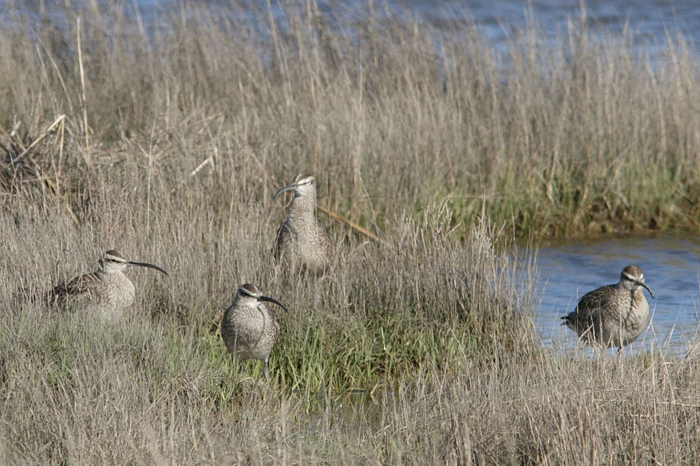 One of the most remarkable events of the past few days has been the unprecedented numbers of Whimbrel reported from the Nummy's Island/Stone Harbor area. On May 5th, Sam Galick and Tom Reed counted a remarkable 1,144 Whimbrel flying in to roost in the area in the evening, which I believe sets a new reocrd count for New Jersey and must have been a fabulous sight. Snakes have been on my mind a lot lately - mostly because I have seen five different species in just the last seven days. This Rat Snake got me marvelling at the amazing climbing skills of an animal that has no limbs! Here it is just hanging out on an old wall - you can see its tail at top left - but just how do they do that?! [photo by Mike Crewe]. Seeing something new for your life list is always fun and Tony Leukering and I were especially pleased to find this King Snake which hung out with us for quite some time. It eventually crossed the track right next to Tony - who was able to put out a hand and tickle it as it glided quietly by. As with all of Cape May County's snakes, this species is harmless to man [photo by Mike Crewe]. In a bit of a blow to Cape May birding, the marina and restaurant area at Twomile Landing has changed ownership, with the new ownership not permitting birding access to the area. This restriction is effective immediately; please pass the word. 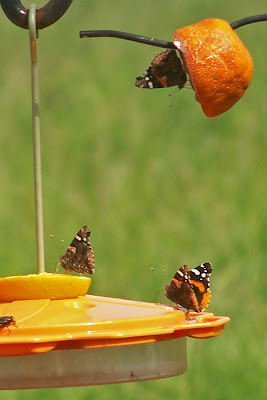 It's been a mixed week weatherwise, though not unusual for the time of year; after Tuesday - with its balmy temperatures - produced a spectacular butterfly flight, things took a turn for the worse for insects on Wednesday and Thursday as temperatures dropped again and the insects found themselves grounded. Indeed, it was rather sad to see so many thousands of Red Admirals just too cold and tired to move, being gobbled up by birds or simply trampled under foot. You normally expect a butterfly to get out of the way and in this instance I think that their rather cryptic underwing markings meant they went un-noticed by most people while sitting helpless on the ground. On Thursday at Higbee Beach, we were picking them up off the trails and placing them out of harm's way, but of course these boom and bust populations are part of nature's way of ensuring that the species survives. Will Kerling, who has been studying butterflies in the USA far longer than me, mentioned to me that this is the biggest movement of spring butterflies that he can remember. Interestingly, I checked up on Red Admiral ecology in the eastern US States in the excellent Butterflies of the East Coast by Cech and Tudor, published in 2005. I was impressed to discover that they had effectively predicted this year's major movement by stating that such large migrations typically occur approximately once every ten years, with previous events noted in 1981, 1990 and 2001. So maybe we could have expected it last year, but perhaps weather trends weren't quite right last spring. With a warming of temperatures on Friday, butterflies were again in the news and I heard reports from as far away as Asbury Park in North Jersey, as well as throughout Cape May County. Text messages to my phone revealed a very widespread movement with numbers perhaps even more impressive than on Tuesday - Tom Reed, for instance, texting 500+ butterflies a minute passing Stone Harbor Point mid-afternoon. My own observations around Cape May Point were intriguing, since Tuesday had produced a movement largely of Red Admirals with a few American Ladies and Question Marks, but Friday seemed to be largely of the last two species, with Red Admirals in the minority. These movements are of course a successful strategy for the butterflies, which allows them to overwinter in the warmer south and avoid the worst of the cold weather in the north. American Ladies and a Red Admiral fuelling up on Chives at Cape May Point [photo by Mike Crewe]. 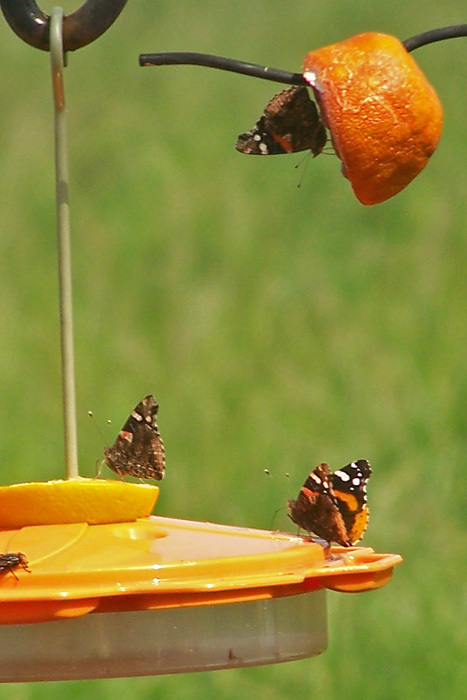 Debbie Hudson sent me this picture of Red Admirals at her bird feeders in Green Creek - which they were having to share with Ruby-throated Hummingbird and Baltimore Oriole! A typical adult male (ie more than 12 months old) Rose-breasted Grosbeak. Note that the wings are solidly black and white with no brown feathers [photo by Mike Crewe]. A typical second-year male (ie hatched last year) Rose-breasted Grosbeak. Note that the wings have light brown primaries, secondaries, primary coverts and median coverts. The head and mantle feathers also have brownish tips to them. These wing feathers are retained from the previous year, when the bird would have been all brown and looked very much like a female [photo by Mike Crewe]. Warblers and other assorted summer arrivals have been in the news here over the last 36 hours or so; locations around Cape May Point and at Cox Hall Creek WMA have all been good for a variety of warblers, with Cerulean and Blackburnian being sighted amongst the commoner species. Warbling Vireo, Yellow-breasted Chat, Wood Thrush and Blue-winged Warbler were singing well at Higbee Beach Friday morning and I hear that over 200 Whimbrel were logged on The Osprey boat trip. 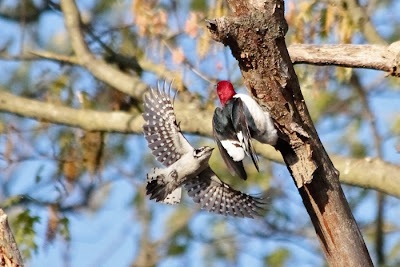 One or two reports of migrant Red-headed Woodpeckers are coming in from around Cape May Point, including The Beanery, where both Yellow-billed and Black-billed Cuckoos were seen this morning. Sam Galick reported a Tennessee Warbler from the state park today and a Cape May Warbler was reported from there by Stephanie Brown on 4th. A White-winged Scoter was reported from the concrete ship on 4th and a Luna Moth became a star attraction at the Northwood Center today as it spent most of the day hanging in a juniper right over the road at the store entrance. Today was a great day to be in Cape May - and things are certainly starting to warm up for The World Series of Birding on May 12! This morning, our Bird, Bugs & Botany was great on Birds and botany, short on bugs, due to overnight rain and overcast skies. Most of the trees are well into leaf now and it's a lot easier sorting all those oaks out now. There was a wealth of plants to be enjoyed for the first hour, but after that we could resist all those birds calls and songs no more and our second hour (and beyond!) saw us focussing on some nice little feeding groups that were working their way through the canopy. Black-and-white, Black-throated Green, Yellow-throated, Blackpoll and Yellow-rumped Warblers, Northern Parulas, Blue-headed and Red-eyed Vireos, Scarlet Tanagers - it was a real treat, and all mixed in with the local Eastern Bluebirds, Chipping Sparrows and assorted woodpeckers. 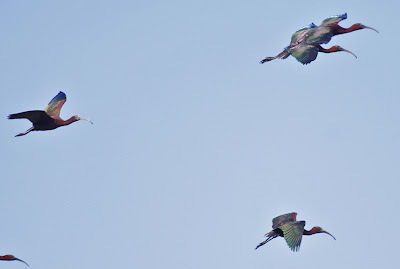 A couple of Ruby-throated Hummingbirds made rapid fly-bys and Green Heron and Belted Kingfisher both boosted our lists. The Northwood Center was pretty busy today too, with Blackburnian and Blackpoll Warblers reported early on and at least one female and four male Rose-breasted Grosbeaks coming to the feeders. Wednesday evening at Northwood also provided me with great views of a superb male Scarlet Tanager and an adult male Baltimore Oriole in the birdbath. Wherever you go in Cape May right now, you are likely to find birds! As well as all the songbird action, I hear that shorebirds are building up nicely at both Stone Harbor/Nummy's Island and Heislerville and, with clear skies right now, I reckon things will be moving out there - what will tomorrow bring?! It's been a while since I had time to put up a photo gallery of recent pictures, so here's a few that arrived recently. Bob Fogg was the latest victim of the White-faced Ibis saga at Cape May. 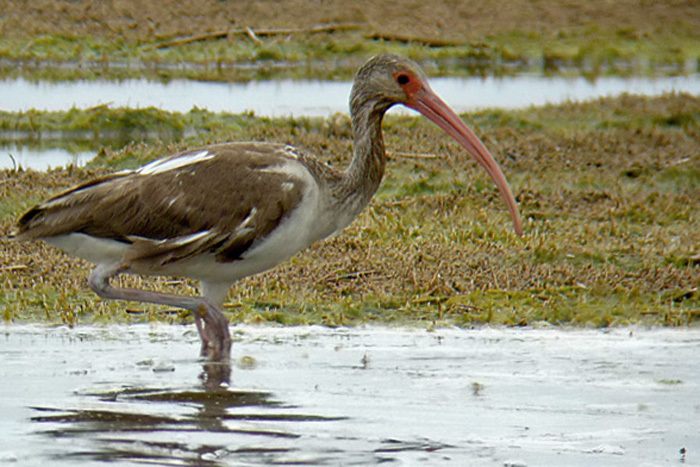 While this is essentially a western bird, White-faced Ibises are turning up with increasing frequency here, to the point where it isn't really safe to assume that all those fly-over birds are glossys! Bob photographed these ibises near his home recently and it was only after he had downloaded the pictures onto a computer that he noticed the bird on the left - a White-faced Ibis, complete with pretty red eye and pale face! [Photo by Bob Fogg] (Click on picture to enlarge). Woodpeckers have their own little battles to contend with and if you are there with the camera, you might get lucky - here a Downy Woodpecker fancies its chances with a Red-headed Woodpecker and both provide a great photographic opportunity [photo by E J Nistico]. For the first few weeks of the Osprey's return, they were certainly one of the most popular targets for camera-toting birdwatchers. I received a lot of photos of this species fishing, but I particularly liked this one as it shows off the Large-mouthed Bass that has been caught so nicely [photo by Joe Siekierski]. I haven't made it over to the back bays to look for birds for several months, so it was nice to hear today that the marshes are already filling up with shorebirds - here, just four of a larger flock of Whimbrel is shoe-horned into the frame - I'm told that there is still plenty of these smart shorebirds to be seen out there [photo by Beth Polvino]. 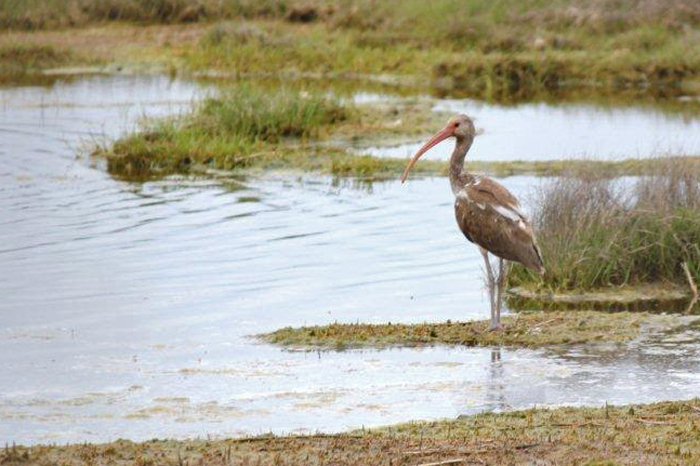 This juvenile, molting into first-summer White Ibis was found at the Wetlands Institute near Stone Harbor earlier this week and typically didn't hang around too long [photo by Cathy Smith].